The one dog demolition machine continues on her merry way. 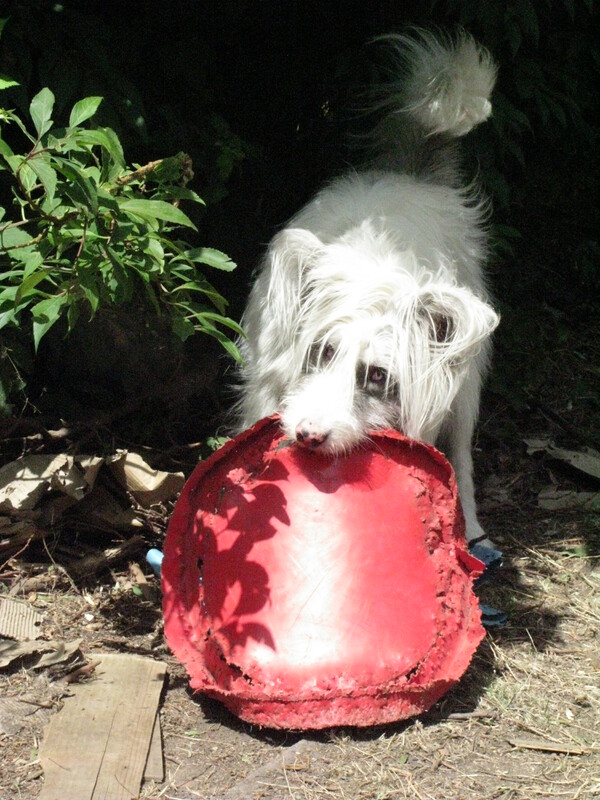 Her enthusiasm for big prey is unabated; her latest prize is a plastic garden chair. On one of my necessarily very frequent checks, I discover her in her stolen goods cache, lying facing the chair with a quizzical, ‘How did you get here?’ expression. But a row of little tooth marks along the top of the chair’s back gives her away. S., daughter of B. next door is visiting. B, who loves animals, is witness to many of Hairy One’s deeds. “She destroys everything”, he comments, bemused as he surveys the cluttered dirt track which is now our garden. He is surprised that a dog who can’t see is so at ease trotting around or over all the debris which she has scattered across the ex-lawn. Ignoring all three of us, Isis batters the base of the red plastic washing basket which she so much enjoyed dismembering last week. I’ve not known another dog who will happily play for hours outside on her own. Isis must have led a very solitary existence before she was rescued, and, although she is very gradually bonding, she is a very independent dog. A deprived little border collie I had years ago had no idea how to play when she came to us, and a friend spent hours crawling round the room with a dumb bell in his mouth before she picked up the idea and joined in! Isis, though, has taught herself to play. And it’s lovely to watch her. This entry was posted in deaf/blind dog plays and tagged blind dog plays ... and plays. Bookmark the permalink. I would love to meet your dumb bell friend! Maybe Isis would too!!! You’d get on, Kerry. He lives on a small-holding in Cornwall and his vet told him that he’s the only small-holder who takes his hens to the vet’s when they’re off-colour! All my previous dogs have loved him but Isis hasn’t met him yet.